A member of the Vinci BMS family. 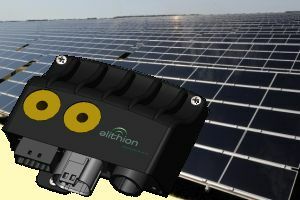 A single module performs all the BMS functions; it senses cell voltages through a number of tap wires. 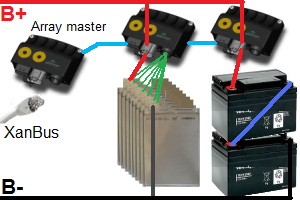 A single Battery Master module performs most BMS functions. 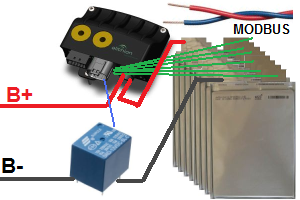 A cell module is mounted on each prismatic cell to measure and report voltage and temperature. 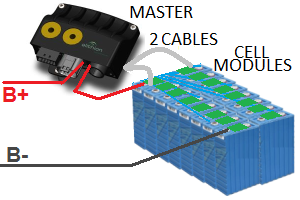 The Battery Master is connected to the 2 cell module at the end of the battery through 2 small cables. The BMS uses a Master/Slave topology, consisting of a Master and a number of modules; communication between them is through a 2-wire daisy chain. 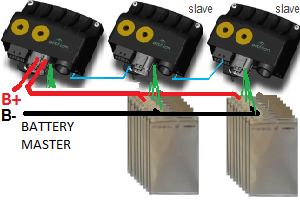 The Slaves sense cell voltages through a number of tap wires. 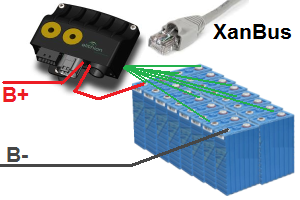 Distributed vs wired Wired: For N cells, N+1 voltage tap wires go from the slave to the cells. Distributed: Cells are divided into banks of up to 25 cells. A cell module is mounted on each cell. 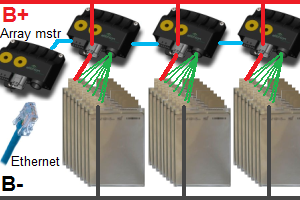 Two 2-wire cables go from the Slave to the two cell modules at the to ends of the bank. Wired: For each slave, for N cells, N+1 voltage tap wires go from the slave to the cells. A Linear daisy chain (twisted pair) runs between the Master and the first VinciLink slave; one between each pair of adjacent VinciLink slaves. Strings in parallel N.A. Up to 16 strings connected directly and permanently in parallel. Note: if not connected directly and permanently in parallel, they are separate batteries, each requiring its own BMS. Policies - Contact us - Mobile site Page published on Mar 09 2019.